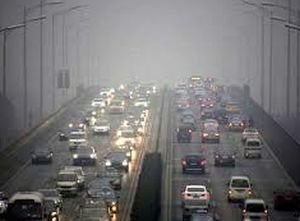 Rediff.com » Business » Does vehicle density in metropolitan cities play a vital role in air pollution? Does vehicle density in metropolitan cities play a vital role in air pollution? Air pollution is a major problem in metropolitan cities of India. Thirteen of the world’s top 20 polluted cities are in India. The government’s own National Air Quality Index data reveals that 23 of the 32 stations across India are showing more than 70 per cent exceeds of the national standards for air quality. 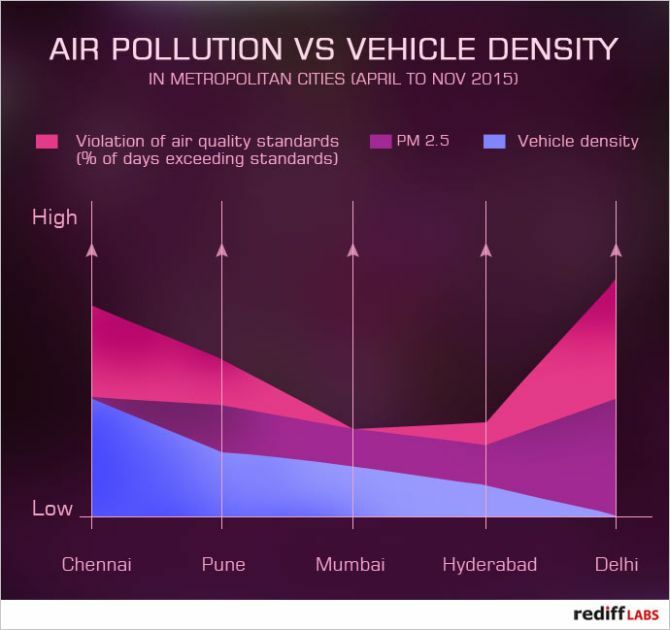 The Rediff labs team tried to correlate vehicle density with air pollution. The above chart shows the comparison between the percentage of days violation of air quality exceeding standard, PM 2.5 and vehicle density in metropolitan cities. Particulate matters 2.5 are the fine particles which are 2.5 micrometre in diameter which causes respiratory diseases. PM 2.5 is produced from all types of combustion, including motor vehicles, residential wood burning. Vehicle density is number of vehicles per mile. Surprisingly in Chennai, the vehicle density is high but PM 2.5 is low, this can be because of the sea breeze as Chennai is in the coastal line of Bay of Bengal. But in Delhi, which has the biggest automobile market has low vehicle density and high PM 2.5. This can be because Delhi is surrounded with industries. From the chart, we found that vehicle density is not highly correlated to air pollution and still other factors like industrial air pollution, power plants, agricultural burning, forest fires might play a vital role in air pollution of metropolitan cities. Are we serious about curbing pollution? Bah!